After residents of the Town of Fort Myers Beach (FL) incorporated and created its own Comprehensive Plan, a new Land Development Code was needed to implement the plan. In 2001, the town retained Spikowski Planning to create this code. The complete archives of the code development process remain on-line, including early drafts of each chapter, summaries of public participation, details of the adoption process, and prior amendments to the code. The Town Council adopted adopted Ordinance 10-09 on September 20, 2010 to modify parking standards in Chapter 34. The Town Council adopted adopted Ordinance 10-06 on May 3, 2010 to change standards for refuse containers in Chapters 6 and 34. The Town Council adopted adopted Ordinance 09-08 on April 5, 2010 regarding LPA membership. The Town Council adopted adopted Ordinance 09-02 on April 6, 2009 to change standards and procedures for administrative amendments to approved master concept plans in Chapter 34. The Town Council adopted adopted Ordinance 09-01 on December 21, 2009 to establish procedures for vacating real property in Chapter 10. The Town Council adopted adopted Ordinance 08-11 on September 15, 2008 to change procedures for appointments to the Local Planning Agency in Chapter 34. The Town Council adopted adopted Ordinance 08-09 on August 18, 2008 to set the lowest floor level for all new and substantially improved buildings in Chapter 6. The Town Council adopted adopted Ordinance 08-03 on April 7, 2008 to modify real estate sign regulations in Chapter 30. The Town Council adopted adopted Ordinance 07-04 on February 22, 2008 to modify lodging regulations in Chapter 34. The Town Council adopted Ordinance 07-09 on January 23, 2008 to modify LPA membership terms in Chapter 34. After earlier public hearings on modified regulations for lodging establishments at Fort Myers Beach, a final public hearing was held on February 11, 2008. Ordinance 07-04 was adopted on that date. Background information is available here and here. On May 8, 2007, the Local Planning Agency had recommended approval of a earlier version of proposed Ordinance 07-04. Ordinance 06-18 has been adopted by the Town Council amending the floodplain regulations in Chapter 6 of the land development code and amending related provisions in Chapter 34 regarding building heights. The Town Council held its final public public hearing on December 11, 2006. A draft of the ordinance and a transmittal memo as considered at the final public are still available. The first public hearing was held on November 6; download the previous draft of the ordinance or the transmittal memo. This ordinance was the subject of a previous public hearing before the Local Planning Agency on September 12, at which time the LPA reviewed the first draft of the ordinance, a transmittal memo; and review comments regarding proposals by Andrew DeSalvo. The Town Council adopted adopted Ordinance 06-14 on September 18, 2006 to modify administrative and code enforcement regulations in Chapters 1, 2, 10 and 34. The Town Council adopted adopted Ordinance 06-13 on June 16, 2006 to modify Chapter 6 regarding lot mowing. The Local Planning Agency held workshops on December 12, 2006, and January 23, 2007, to discuss two subjects for potential changes to the land development code: changes to building coverage percentages, and changes affecting neighborhood flooding. On October 10, 2006, the Local Planning Agency held a workshop concerning the conversion or parcelization of existing hotels and motels. A background memo is available here. Ordinance 06-09 modified the composition of the Local Planning Agency, effective March 20, 2006. Ordinance 05-22 increased the number of members of the Local Planning Agency, effective September 12, 2005. Replacement pages are now available for both ordinances. Ordinance 05-24 made an emergency amendment to chapter 14 which has since expired. Ordinance 05-21 added a new section 34-636 to chapter 34 which addresses parcelization and subdivision of existing buildings. This ordinance was adopted and took effect on June 6, 2005. Replacement pages are available here. Earlier drafts of these ordinances and all related documents are available here. Codified versions are available immediately below. Ordinance 05-07 was adopted on April 18, 2005, amending chapters 1, 2, 6, 10, 26, and 30. Ordinance 05-08 was adopted on April 18, 2005, amending chapter 34. Ordinance 05-21 was adopted on June 6, 2005, adding a new section 34-636 to chapter 34 which addresses parcelization and subdivision of existing buildings. Codified versions of these chapters are available here, including all changes through Ordinance 05-08. Replacement pages that reflect Ordinance 05-21 are available here. The previous codification of the entire code, as amended through Ord. 04-09 but NOT including these latest ordinances, can be downloaded here. The code was overhauled chapter by chapter between 1999 and 2003; these ordinances were to resolve various errors, problems with implementation, and inconsistencies between chapters. Final public hearings were held before the Town Council on April 4 and April 18. Two separate ordinances were proposed: The first ordinance was to amend chapters 1, 2, 6, 10, 26, and 30, and the second was to amend chapter 34. Both ordinance drafts and all backup material may be downloaded by clicking here. These ordinances were formally introduced before the Town Council on March 21, 2005. These code updates had been under consideration since June 2004. Early drafts and backup material that went to the Local Planning Agency for those hearings may be downloaded by clicking here; also download the January 12 recommendations from MRTF here; additional backup for the January 25th continuance here regarding back-lit awnings, exterior lighting, and appeals; additional backup for the February 8th continuance here about fill permits, floodplain standards, residential uses in marinas, and corner visibility; and additional backup for the February 22nd continuance here about fill permits, code interpretations, density, hotels/motels, and storage containers. The LPA directed that chapters 14 and 27 be remanded to the Marine Resources Task Force for further consideration. The Marine Resources Task Force began reviewing drafts of potential amendments to the Land Development Code regarding activities on and along the beachfront in November 2004. Further discussion was held at the December 8th meeting; backup material for December 8th is available here. Final recommendations were made at the January 12 meeting; backup material for that meeting is available here. Proposed changes to Chapters 14 and 27 were later remanded back to the Marine Resources Task Force for further consideration. On October 19, 2004, the Local Planning Agency reviewed a preliminary draft of amendments to Chapter 30 of the Land Development Code, which regulates signs. The public was invited to review the latest draft of amendments to Chapter 30. This chapter was overhauled in 1999 with additional minor amendments since that time. Ordinance 04-08 modifies the regulations for the outdoor display of merchandise and outdoor dining in the DOWNTOWN zoning district. The current regulations are found in Section 34-677 of the code. Click here for the final recommendation of the Local Planning Agency after their June 8th public hearing. Ordinance 04-09 amends the town’s floodplain regulations, which are found in Article IV of Chapter 6 of the land development code. Floodplain regulations establish minimum floor heights for new and substantially improved buildings to protect them from future flood damage. These changes do not alter these minimum heights but affect many other provisions of these regulations, particularly as they relate to existing buildings. Codification pages reflecting the changes made by Ordinances 04-08 and 04-09 are available here. The complete Chapter 6 codified through Ordinance 04-09 only is available here. On May 18, 2004, the Local Planning Agency considered revisions to the town's floodplain regulations which are found in Chapter 6 and the outdoor display of merchandise regulations that are found in Chapter 34 of the Land Development Code. The LPA recommended approval of the floodplain regulations but continued the public hearing on outdoor display until the June 8th noon meeting; a revised draft is available here. A short cover memo to the Town Council on Chapter 10. The Local Planning Agency held its formal public hearing on the new Chapter 10 on November 18, 2003. The LPA voted unanimously to find this ordinance consistent with the comprehensive plan and to recommend its approval, including the final proposed changes to §§ 10-321(a)(3) and 10-416(c)(7). A revised draft of the proposed ordinance that reflects the LPA's discussion on September 16 (and other minor changes) is available with the complete background material for that public hearing; please also download a supplemental memo dated November 17 with additional proposed changes to 10-321(a)(3) and 10-416(c)(7). The Local Planning Agency reviewed proposed revisions to Chapter 10 of the Land Development Code on September 16. Click here to download all background material for that meeting. Chapter 10 codified through Ordinance 04-01 only is available here. Previous chapter 10 as it existing prior to adoption of Ord. 04-01. On December 15, 2003, the Town Council adopted amendments to Chapter 2 substituting a special master for Lee County's hearing examiner for code enforcement cases. Ordinance 03-12 contains these changes, in underline-strikethrough format for an easy comparison with the previous chapter. Codified versions of this and all other chapters of the Land Development Code are now available; a previous codification through Ordinance 03-12 only is available here. On November 3, 2003, the Town Council adopted amendments to Chapter 34 regarding temporary welcome stations. Ordinance 03-11 contains these changes, in underline-strikethrough format for an easy comparison with the previous chapter. Replacement pages for Chapter 34 are available here. Codified versions of this and all other chapters of the Land Development Code are now available. The Fort Myers Beach Local Planning Agency discussed residential design standards again at its meeting on October 21, 2003 at noon at Town Hall. A previous discussion on this subject was held on June 17, 2003. On June 2, 2003, the Town Council adopted amendments to Chapter 30 on signs. Ordinance 03-06 contains these amendments. Codified versions of this and all other chapters of the Land Development Code are now available; Chapter 30 codified through Ordinance 03-06 only is available here. The first five pages of Ordinance 03-03 can be downloaded here, including the title page, sections 1 through 8, and the signature page. Exhibit A is the interim zoning map as described in Section 34-613(a); it cannot be downloaded at this time, but single copies are available from Town Hall at no charge. Exhibit B is the full text of Chapter 34. Please also download a memo from Town Attorney Richard Roosa with corrections to certain residential setbacks in Exhibit B. See also a memo from Town Attorney Richard Roosa with corrections to certain residential setbacks in the published versions of Chapter 34. Codified versions of this and all other chapters of the Land Development Code are now available. A brief comparison of the previous and new residential setbacks can be downloaded here. Click here to download the original backup material for the March 3, 2003, public hearing on Chapter 34 and here for a final supplement, which includes revised language on numerous subjects. This material incorporates all the relevant information from the January 5 and January 27 memos. Click here for a copy of the interim zoning map that was adopted as part of Ordinance 03-03. Due to the extensive public comments and formal recommendations made at the Local Planning Agency's (LPA) public hearing on December 17, 2002, the options for regulating short-term rentals were revised and were included in the background material for the January 13 meeting; this memo, dated January 5, also summarizes all actions taken by the LPA on December 17. ENTIRE CHAPTER 34, LPA Draft for 12-17-02 public hearing (Entire document except for zoning map; includes ordinance, table of contents, and Articles I through V -- pp. 1-218). The new code proposes the use of floor-area-ratios (F.A.R.) to cap the size of new buildings. This measure would replace the current system of "maximum lot coverages." Click here for examples of how floor-area-ratios would apply to new homes. A joint workshop with the Town Council was held on October 22 to review the complete draft of Chapter 34. See details above. On June 25, the LPA held a workshop to review the latest draft of Article I and Article III of Chapter 34 of the code (dated June 17, 2002). These articles contain the definitions, the zoning district regulations, and the new zoning map. Click here for a memo explaining these articles. Single copies of the proposed new zoning map can be obtained at no charge from the Fort Myers Beach Town Hall. Click here for a memo explaining the use of "floor-area-ratios" which would cap the size of new buildings. On March 19, the LPA reviewed the latest drafts of Articles I and II of Chapter 34 of the code. Click here to download the background material for that discussion. On February 19 the LPA reviewed the latest drafts of Chapter 34 of the code, specifically Article V (supplemental regulations) and Article VI (nonconforming buildings, uses, and lots). Click here to download the background material for that discussion. On September 23, 2002, the Town Council held its final public hearing on a minor change to Chapter 14 and adopted it through Ordinance 02-29. These revisions are reflected in the latest version of Chapter 14 which is available below. Spikowski Planning Associates prepared the town's first Comprehensive Plan, assisted by Carol Cunningham & Associates; Dover, Kohl & Partners; Smith·Osborne Associates; Mohsen Salehi Consulting Services; and Camp Dresser & McKee Inc. This Comprehensive Plan became effective on January 1, 1999. The initial chapters of this plan, including the Community Design Element, can be downloaded in PDF format by clicking here. The entire new Comprehensive Plan is now available on-line from the town's web site. Also, the entire plan can be downloaded here; or just the original existing and future land-use maps; or just the revised future land-use map with the amendments that took effect on July 22, 2004. You will need the Adobe Acrobat Reader to access these files; it is available free by clicking on the yellow "GET ACROBAT READER" button (located above, or just above the chart listing the individual elements) and you can download the free viewer directly from Adobe. Those interested in the entire plan can also purchase a printed copy with the land-use maps from the Town of Fort Myers Beach. A printed copy is also available for review at the reference desk of the Fort Myers Beach Public Library. A wall-sized copy of the future land use map can be purchased from this web site or may be downloaded here. See the next section of this page for amendments to this plan since it was adopted. The Fort Myers Beach Comprehensive Plan received an award from the Florida Planning and Zoning Association as an "outstanding public report" for 1999. Final public hearings were held on December 20, 2004 and January 3, 2005 to adopt Ordinance 04-13 to add the latest five-year schedule of capital improvements into the Fort Myers Beach Comprehensive Plan. Replacement pages that reflect this ordinance are now available. Background material can be downloaded. The LPA public hearing originally scheduled for September 14 was held on September 21 and the earlier Town Council public hearing was held on September 27, 2004 concurrently with annual budget hearings. Background material for both earlier hearings can also be downloaded. On June 21, 2004, the Town Council adopted Ordinance 04-10 amending the Comprehensive Plan. Four applications for small-scale amendments to the Future Land Use Map were considered; two were approved and two were denied. Click here for a map showing the two amendments that were approved; click here for a revised Future Land Use Map for the entire town. Replacement pages for the Comprehensive Plan are available here and also from the town's web site. 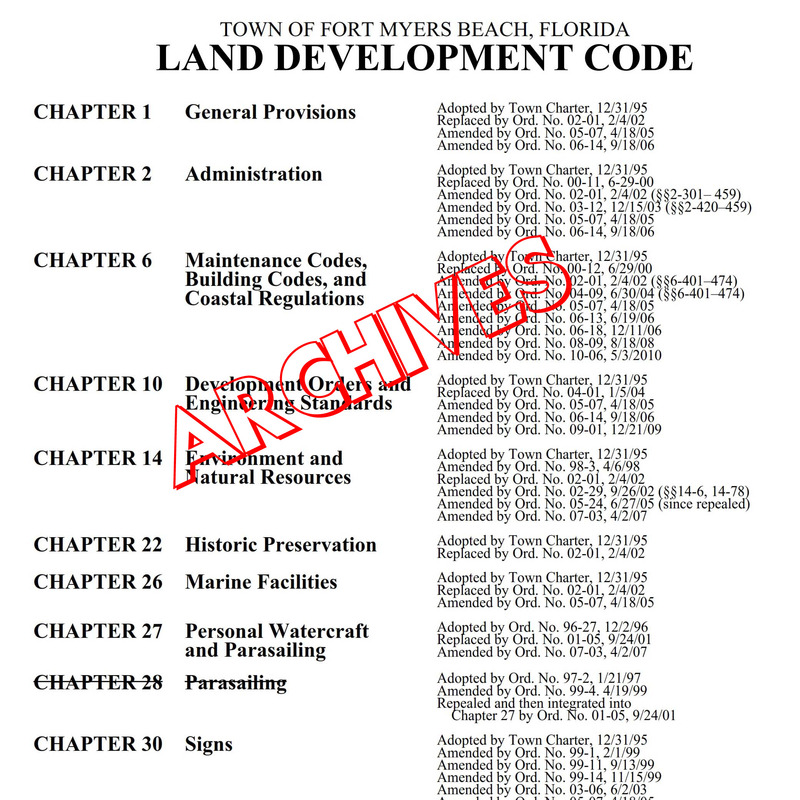 On December 15, 2003, the Town Council held its final public hearing on a single 2003 amendment to the Fort Myers Beach Comprehensive Plan: Application 2003-1-TEXT, annual updating of the five-year schedule of capital improvements (Table 11-7, page 11-22). This amendment was adopted by Ordinance 03-13. Revised pages for the Comprehensive Plan can be downloaded by clicking here. The Local Planning Agency discussed next year's comprehensive plan amendments and the upcoming Evaluation & Appraisal Report at its meeting on October 21, 2003. The Town Council will discuss these same subjects on November 17, 2003. On June 2, 2003, the Town Council considered whether to accept applications for "small-scale development amendments" to the Comprehensive Plan more often than the current annual cycle for considering all other amendments. A memorandum providing background information on that issue can be downloaded by clicking here. Three amendments were considered to the Comprehensive Plan on 2002; all were requested by the Town of Fort Myers Beach. The first public hearings were held on April 16, 2002, before the Local Planning Agency. The LPA recommended approval of the first and third applications; the public hearing on the second amendment was continued until May 21, 2002, when a formal recommendation was made. The next step in this process was a public hearing before the Town Council, which was held on June 17, 2002. At that public hearing, application 2002-2-TEXT was denied, the other two applications were tentatively approved and were transmitted to state and regional agencies for their review. Final public hearings were held on the two remaining applications on September 9 and 23 and both were approved; click here for a copy of the adopting ordinance, Ordinance 02-07. Revised pages for the Comprehensive Plan can be downloaded by clicking here; these pages will update previous printings of the Comprehensive Plan. Application 2002-1-TEXT: Annual updating of the five-year schedule of capital improvements (Table 11-7, page 11-22). Application 2002-3-TEXT: Revise the Recreation Element to establish policies regarding public acquisition of beachfront land. Two previous amendments to the Comprehensive Plan were adopted by Ordinance 01-07 on September 24, 2001 (effective date November 21, 2001). Click here to download the final ordinance as adopted. Click here to download replacement pages for the Comprehensive Plan. Application 2001-1-TEXT: Annual updating of the five-year schedule of capital improvements (Table 11-7, page 11-22). Application 2001-2-TEXT (requested by the Town of Fort Myers Beach): Consideration of amending Comprehensive Plan Policy 4-C-6 to encourage landowners along both sides of Old San Carlos Boulevard (see inset map) to build second and third stories over their storefronts without being limited by the current motel-room equivalency factor. Click here for a comparison of previous, current, and pending regulations along Old San Carlos, and click here for the final ideas on revising 2001-2-TEXT. Application 2001-3-TEXT & MAP (requested by Seafarer’s 2000, Inc. & Seafarer’s 1997, Inc.): Consideration of amending Comprehensive Plan Policy 4-C-2, 4-C-5, 4-C-6, and/or the Future Land Use Map to increase the number of hotel rooms that can be built on the second and third stories of the properties near Times Square known as Seafarer’s Village and Helmerich Plaza. NOTE: this amendment was withdrawn by the applicant. Application 2000-1-TEXT: Annual updating of the five-year schedule of capital improvements (Table 11-7, page 11-22). On February 22, 1999, the Florida Department of Community Affairs issued a notice of intent to find the new Comprehensive Plan in compliance with Florida's growth management laws and rules. A copy of the town's Response to DCA is also available here, in PDF format. This response summarizes most of the changes that were between the transmittal version of the plan and the final adopted version. The Fort Myers Beach Town Council has approved a development agreement for a proposed development known as Seafarer's Plaza located in the block between Estero Boulevard, Crescent Street, and Fifth Avenue. This agreement was approved at the final public hearing on April 15, 2002. Click here to download a copy of this agreement. Two small-area planning studies can be downloaded here. The first is the Old San Carlos Boulevard-Crescent Street Master Plan; the other is the Santos/Palermo Circle Planning Study. Both are available here in Adobe PDF format. Printed copies are available from the Town of Fort Myers Beach. A copy of "Strategies for Improving Access to and Traffic Circulation within the Town of Fort Myers Beach," by CRSPE Inc. and Mohsen Salehi, is available here. This report is dated January 2002 and can be downloaded by clicking here. For a discussion of returning Second and Third Streets to two-way traffic between Old San Carlos and Crescent, click here. HURRICANE CHARLEY: Available here, a map that shows the precise track and wind speeds of Hurricane Charley as it crossed the Florida peninsula on August 13, 2004. This map also shows the approximate extent of tropical storm and hurricane force winds outward from the eye of Hurricane Charley. This map is based on hurricane locational and wind speed data from the National Hurricane Center and was prepared by Amy Hoyt of the Lee County Commission staff. ALSO: similar maps, with Hurricane Frances added, and with both Frances and Jeanne added. On May 17, 2004, the Town Council approved two resolutions that adopted "official" and "historic" zoning maps for the entire town. These maps are the result of the new zoning chapter (chapter 34) of the town’s land development code, which was adopted by Ordinance 03-03 on March 3, 2003 to implement the town’s 1999 Comprehensive Plan. Background memos are now available that explain both maps and contain attachments with drafts of resolutions and reproducible copies of the maps. Ordinance 03-03 adopted an "interim" zoning map that assigned new zoning districts to all land in the town. The new "official" zoning map uses the same zoning districts as assigned by Ordinance 03-03 but adds relevant variances, special exceptions, special permits, rezonings, and similar approvals that were approved by resolution through April 1, 2004. The conversion of the "interim" zoning map into the "official" zoning map is mandated by Section 34-614 of the town’s land development code. The official zoning map includes key numbers that are explained by detailed notes that provide a record and index of variances, special exceptions, special permits, and similar approvals. The new "historic" zoning map shows the zoning districts that applied to all properties immediately prior to the adoption of Ordinance 03-03 and all variances, special exceptions, special permits, and similar approvals that had been approved by Lee County or the Town of Fort Myers Beach prior to the adoption of Ordinance 03-03. This map provides a historic record of past zoning actions and prior zoning status that may affect the nonconforming status of certain properties within the town. The historic zoning map also includes key numbers that are explained by detailed notes that provide a history of prior rezonings, variances, special exceptions, special permits, and similar approvals that had been approved before Ordinance 03-03 was adopted on March 3, 2003. Both of these maps can also be downloaded in files that permit them to be printed out in full color for wall mounting (up to 36" by 48"). The key numbers refer to the same index of variances and special exceptions in the resolutions. For everything else you might want to know about the Town of Fort Myers Beach, visit their web site.